Wait a minute. Is that a camel in Iowa? 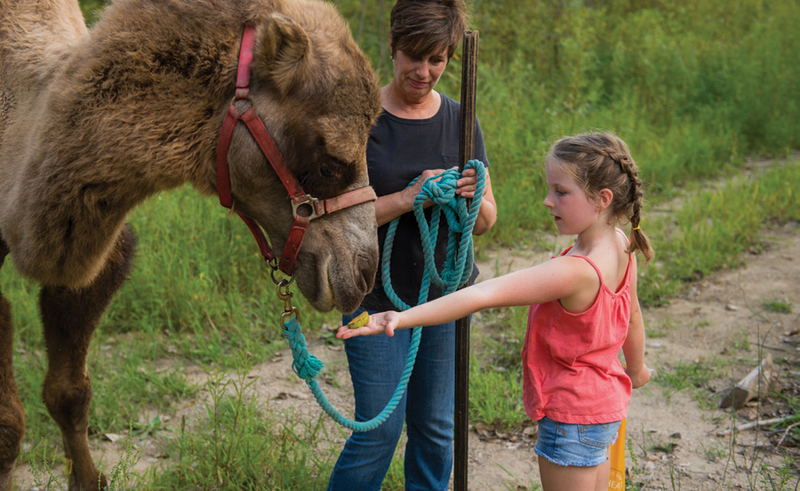 As Colleen Osborne stands in her backyard, a large two-humped camel stretches his long neck toward her, angling for a touch and a treat. Happy to comply, Osborne scratches his ears and pops a carrot into his large, velvety mouth. The camel’s bushy eyebrows bob in appreciation as he looks at Osborne with his googly, golf-ball-sized black eyes fringed with two rows of long eyelashes. Osborne, Quality Manager at POET Biorefining – Jewell, looks back at the camel just as admiringly. Moby, a 4-year-old Bactrian camel, isn’t just an animal. He’s a part of Osborne’s family – and garners regular attention from curious passersby. Of course, Osborne and her husband, Allen, are used to people stopping by their Dows, IA acreage to ask questions. They’ve been building their own house – frame by frame – since 2008, primarily out of old cedar telephone poles the Osbornes have transformed into planks of wood with a sawmill. 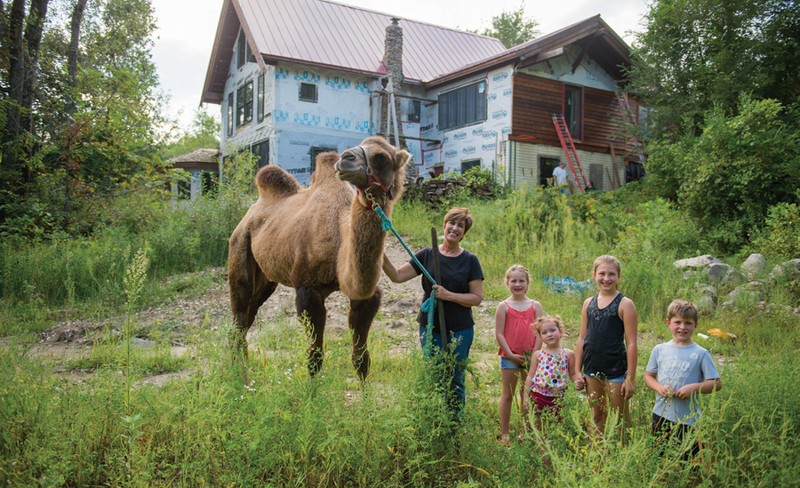 “We have just as many people stopping by to see the house as we do the camel,” Osborne says. The attention doesn’t bother Osborne. She loves sharing stories about Moby and her house with others. Osborne takes this same open, honest approach to her work at POET. Osborne deftly monitors plant operations and quality. That’s kind of Osborne’s mantra. She doesn’t like to be bored. In fact, that’s how she ended up with a camel as a pet in the first place. One day, Osborne’s husband mentioned that it might be fun to raise a camel. On a whim, the couple went to an exotic animal auction in Macon, MO. There, they met a 6-month-old Bactrian camel. “I fell absolutely in love,” Osborne says. They didn’t take that camel home, but Osborne was smitten. The idea of owning a camel was something they just couldn’t shake. “We started talking to a lot of people and doing a lot of research on what it would take,” she says. She says she thinks the feeling was mutual. So three years ago, they took the then 1-year-old camel home to their acreage outside of Dows, IA. What does he eat? Where does he sleep? How do you take care of him? Her granddaughter’s preschool class visited Moby a couple of years ago. Just as often, people driving by Osborne’s acreage will stop to check out their house – a big, timber-framed house that the couple has been building, from the ground up, for the last seven years. “It’s what we do in our spare time,” she says. In the meantime, they keep working – and answering questions about their house projects and unique pet. Between work at POET, work on the house and working with Moby, there’s never a dull day in Osborne’s life. “There are some days I would take a little boring,” she says. But if that were really true, she wouldn’t have Moby.